Notes: If crème fraîche is unavailable, use lightly sweetened sour cream. We like this soft polenta topped with blackberry jam, but it's equally delicious topped with another jam, fresh fruit, or butter and maple syrup. In a 2 1/2- to 3-quart pan over high heat, bring 3 cups water and the milk to a boil. Reduce heat so liquid is barely boiling.Stirring constantly, pour in polenta in a thin, steady stream, pausing occasionally to break up any lumps. Stir in sugar and salt. Simmer, stirring often, until polenta is soft and creamy to bite, 20 to 40 minutes (if heat is too high, bubbles may "spit" globs of hot polenta out of the pan). 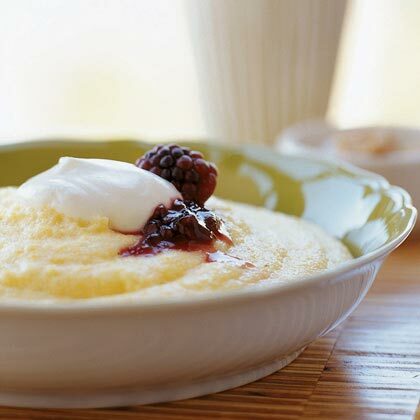 Ladle polenta into bowls and top each serving with about 1 tablespoon blackberry jam and a dollop of crème fraîche.